Mark Peel has added to his burgeoning literary list with this excellent book on M.C.C. tours immediately after the end of World War Two until the successful, if acrimonious, tour to Australia in 1970-71. How times change. What makes Ambassador of Goodwill fascinating is the change and shift in emphasis of the reason for the tours. Whilst the book starts with tours where ambassadorial behaviour was expected as much off the field (through glad-handing at functions etc) as on it, future tours fairly quickly differed in this approach. Mark has taken each tour and given the name of the squad with the manager as well as details of not only the Tests but also the - in some cases, many - tour matches. 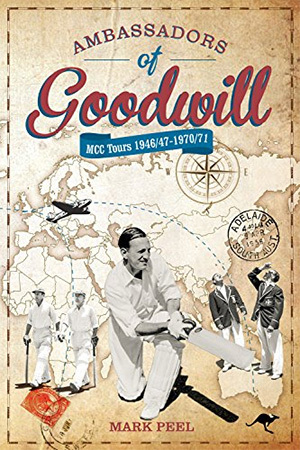 Liberally embellished with some amusing off the field and travelling tales, Ambassadors of Goodwill quickly becomes a most interesting book to read. Managers were picked for their ability, so to say, to fly the flag and there certainly appear to have been some colourful characters and possibly some surprising, yet successful, choices. The reader may sense the change in on the field etiquette and the possibly greater desire to win when the more professional age arrived. There appears to have been much tension at times and the demands of the players as time went on to avoid too many functions is well chronicled. Not, mind you, that some did not indulge in revelry and hospitality, as is also mentioned. Travelling woes make an illuminating mark on the book. Remember that many of these tours were of five or six months duration and involved a passage by sea. Sometimes there would be flights involved and a tale emerges of an aborted landing in India to avoid a cow on the tarmac. The end of tour reports by both captain and manager make interesting reading as do some of the comments by players. It was not only the players who let themselves down occasionally, the tale of a journalist throwing a typewriter at an Indian grandee being reported to Lord's. An apology was sought but was not forthcoming. Much is learnt about former players and administrators alike. The book shows just how close Henry Blofeld came to an England cap rather than taking his presumably more usual writing equipment for journalistic purposes to the ground when illness overcame a lot of the squad on one tour. Another illuminating chapter is the one which deals with the length of time which the cricketers had to spend away from their wives and loved ones. Given the length of time the tours took, their concerns were completely understandable. Through the generous assistance of the M.C.C Library, Mark Peel has written an engrossing book about this period. The 1960s may not have been the most captivating decade in the history of the game but Mark has made sure that many aspects of the general generation from the end of World War Two to the 1970s are well chronicled in Ambassadors of Goodwill.